The primary conclusions of the CETEM study, based on extensive epidemiological studies (analyses of urine, blood and hair samples) of approximately 800 residents, found “low” human exposure to arsenic in Paracatu. Exposure levels were below the average levels found in the US and similar to other cities in São Paulo state with no history of arsenic exposure. Cancer rates in Paracatu are comparable to other cities in Brazil and CETEM researchers found no evidence of arsenicosis, the skin lesions most commonly associated with chronic arsenic poisoning. In regards to airborne dust, the CETEM study points to arsenic levels comparable to other cities in Europe and well below US norms. Samples taken by the CETEM study showed that water quality immediately downstream of the tailings dams is well within regulatory limits and analysis by CETEM found no ground water contamination from Kinross operations. Although Kinross has retained CETEM in the past to undertake technical work regarding gold recoveries, this should not detract from CETEM’s independence or that of its experts. In compliance with the request from the Municipal Prefecture of Paracatu, CETEM coordinated its actions to form a team of 70 researchers in the scientific field, and presented a work proposal in 2010 for the “Evaluation of Environmental Contamination by Arsenic and Epidemiological Study of Associated Environmental Exposure in Human Populations of Paracatu-MG.” The researchers were invited based on their specialization in environmental toxicology, epidemiology, clinical toxicology, environmental medicine, environmental chemistry, environmental geochemistry, evaluation of risks to human health and the environment, among others, as seen from the Technical Team. The studies began in March 2011, with the release of the first installment of resources, and ended in December 2013. Click here to view the complete study (PDF). The study coordinated by the INCT, the UFMG, and the University of Queensland in Australia, has revealed through chemical analyses that arsenic concentrations in Paracatu are within the safety limits accepted both nationally and internationally. The INCT-Acqua Institute was established by a program created by the Brazilian Ministry of Science, Technology and Innovation with the aim of supporting the development of institutes at the forefront of scientific and technological knowledge in strategic areas for the sustainable development of the country. With a multidisciplinary team from Brazil and abroad, INCT-Acqua offers a systemic and integrated approach to problems arising from the interface of mineral and metallurgical activities with water quality, soil, air and aquatic biodiversity. While financed by Kinross, the project’s results are independent and its authors highly respected academics. The project in Paracatu is led by Professors Virginia Ciminelli, a chemical engineer from the Universidade Federal de Minas Gerais, Massimo Gasparon, a geochemist from the School of Earth Sciences of The University of Queensland (Australia) and Professor Jack Ng, a certified and globally renowned toxicologist from the National Research Centre for Environmental Toxicology of The University of Queensland. Having spent the last six years studying arsenic in Paracatu, presenting their key findings at international arsenic conferences and in peer-reviewed journals, the research team is able to provide an objective and scientifically based exposure assessment of arsenic in Paracatu. Kinross offers annual arsenic testing to all its employees. The results are communicated to employees during their periodic medical checkups. 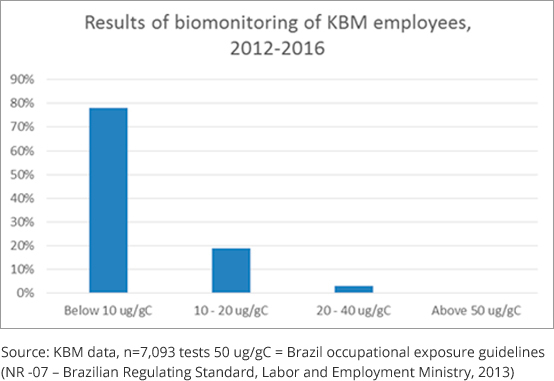 Urine tests of on average 1,418 samples per year since 2012 indicate all employees tested below screening levels of less than 50 µg/g of Creatinine for arsenic exposure, which is the Brazilian occupational exposure guidelines (NR -07 – Brazilian Regulating Standard, Labor and Employment Ministry, 1994)7. Levels below 10 μg/gC are considered to have no exposure. Out of 7,093 tests conducted between 2012 and 2016, 78% had arsenic values less than 10 μg/gC, 97% less than 20 μg/gC, and 100% less than 40 μg/gC. For comparison, note that after a seafood meal, the level of arsenic in urine may be greater than 200 µg/gC, after which it will decline to less than 35 µg/gC over a period of 1 to 2 days. 4.Hydrogeology of an As-mineralized fractured phyllite, and implications for groundwater as dispersion. 10.Adsorption and desorption of arsenic on an oxisol and its constituents.